Oakland, Calif. (September 13, 2018) – More than 20 years since the Navy closed Naval Medical Center Oakland in 1996, government officials, community leaders and SunCal executives gathered on Wednesday, September 12, to mark the groundbreaking of Oak Knoll, a 183-acre master-planned community that will transform the property in the Oakland Hills. Oak Knoll is being developed by SunCal, one of the largest real estate development companies in the U.S. that specializes in large-scale, mixed-use master-planned communities. Oak Knoll will be a mixed-use development that will feature up to 918 homes including single-family residences, townhomes and estate homes; 80,000 square feet of commercial retail uses in a village center; and 84 acres of public parks, open space and publicly accessible trails. The community will also include a creek running through the property that will be restored to natural conditions; a restored Club Knoll building that will serve as a new community center for residents and the general public; and a memorial honoring military personnel who served or were treated at the Naval Hospital. As a Naval complex, Oak Knoll treated thousands of wounded military personnel during World War II and continued serving through the Korean War, Vietnam War, Gulf War and peacetime before it closed in 1996. When completed, Oak Knoll will be home to charming neighborhoods, engaging open spaces and inviting public parks, giving residents the chance to enjoy the Oakland Hills and all this special place has to offer. From access to the East Bay Regional Park System to integrated community trails, Oak Knoll will provide its residents and the public with walkable trails that will flank a restored creek, and will welcome families, joggers, cyclists, hikers, dog walkers and naturalists. Abundant pathways and open space will connect family-oriented neighborhoods with a community-focused retail village that will feature shops, restaurants and public meeting spaces. Oak Knoll will be a vibrant community with a laid-back feel and small town atmosphere. For more information, visit www.oakknollcommunity.com. GROUNDBREAKING FOR SUNCAL’S OAK KNOLL COMMUNITY — A groundbreaking for SunCal’s 183-acre Oak Knoll master-planned community was held in Oakland, Calif., on September 12, 2018. The Oakland Hills property is the former site of U.S. Naval Medical Center Oakland that closed in 1996. 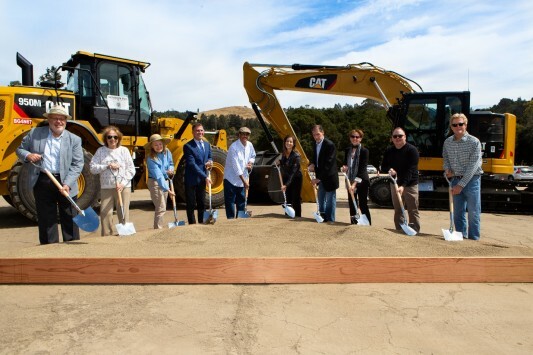 Participating in the groundbreaking were members of the Oak Knoll Coalition, a community group, who were led by (starting fourth from left, and left to right) SunCal Vice President David Soyka, Oakland City Council President Larry Reid and Oakland Mayor Libby Schaaf.